If, like me, you are a consumer of popular science books, it can be bewildering when reading newspapers and following social media that there is so much antipathy, confusion and hostility towards science and scientists. Where does it all come from, is it a problem and what can we do about it? Those are the questions that Shawn Otto attempts to answer in The War on Science. While the book primarily covers science policy and politics, it contains a wealth of information on scientific topics (creationism vs evolution, the anti-vaccine movement and climate change) that feature heavily in the political debate today. Although the book is very US-centric, the topics and debates are of worldwide concern and, one could argue, the degradation of science in the public debate has progressed the farthest and is at its most extreme in the United States. Otto does an excellent job of describing the backstories on a number of scientific issues behind the shift in the US from a country based on the principles of the enlightenment and its veneration of reason and science to the situation today where science is often considered ‘just another opinion’. Chapters focusing on the research, corporations and political movements behind the denial of climate change on the US are particularly fascinating and extremely informative. The alignment of a wide array of different interests to sow doubt on climate science and even intimidate climate scientists could be the subject of a book of its own. 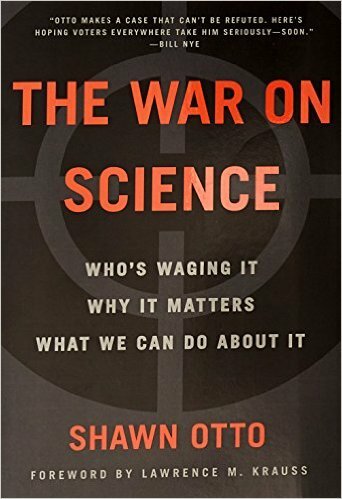 Throughout The War on Science, Otto argues why this change in the role of science in society is an enormous problem, and how the scientific community and scientists have contributed to their own problems. Otto also makes an excellent case that ‘science is inherently political, but it is not partisan’. He describes a number of steps that the scientific community should take to move science back into the political debate so that public policy can be determined on the basis of fact to as large an extent as possible. Here, Otto uses a number of international examples, such as the New Zealand idea of a governmental science advisory office that conducts scientific reviews of policy proposals and that includes peer reviews of the advisory’s recommendations. While many of Otto’s recommendations make excellent sense, they seem more suitable for parliamentary based governments than they do for the United States with its division of powers and federalist structure. 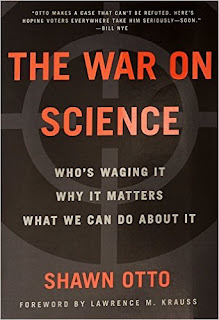 I found The War on Science to be an excellent and informative book and highly recommend it. Otto has a very good journalistic style to his writing and is obviously well versed in science. The book is also an important one, particularly in today’s political climate, where both the US and Europe are facing looming issues that require science to provide facts in order to inform possible options and solutions.